I used to use Naked Wines a few years ago because if you drink grapes it has to be red for me. To me white is too tart and pink it too sweet but red is just right. Everyone is different of course but I digress. 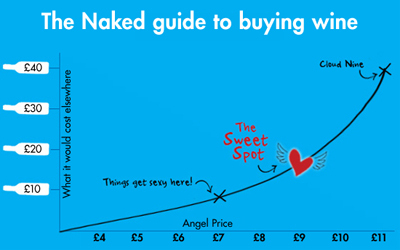 Naked Wines market this idea of the sweet spot in wine pricing where the cost benefit really peaks. Anymore expensive and you are increasing price faster than the increase in enjoyment can keep up with. Any less expensive and the quality is dropping off faster than the few pence you are saving. In wine because its relatively cheap compared to aged spirits its the UK tax system which drives this metric. In whisky we have the same thing but for a different reason. We are currently in a bit of a bubble with secondary markets pumping the retail market which in turn makes whisky more a collectable commodity than a foodstuff. All of this was a long winded way of saying that core range 18 year olds are for me the sweetspot of any range. The late teen whisky though must be under £100 in the UK and ideally between £50-£75 to really get the most value for your purchase. The Glengoyne 18 is exactly that kind of whisky. Other notable examples include Bunnahabhain 18, Deanston 18 and the Glenlivet 18 even. As with every rule though there is a few notable exceptions. The Highland Park 18 is too expensive and the Jura 18 is too poor. The 18 year old from Glengoyne is a mix of first-fill and refill ex-sherry casks aged for a minimum of 18 years and bottled at 43% ABV. It has been around since 2012 and is available for around £75 in the UK. All perfect metrics to sit alongside the natural colour and classic bottle design. Nose – restrained and shy but it does hint at dried fruit, orange marmalade and a touch of spice. The sweet nutty aroma is very like marzipan as well. Palate – There is butterscotch and more marmalade. A touch of toast makes this a good metaphor for breakfast. Finish – As is the style with Glengoyne it becomes drying and thicker on the finish. The lingering finish gives you cinnamon sticks and more spice than in the nose by some margin. Good rounded and robust spicy whisky from the Highlands. There is elements of the Speyside region and elements of the Lowlands. While some Highland whiskies are somewhat confused on their identities Glengoyne is sure footed and represents the people of the Highlands well.